Bisque (unglazed porcelain) cast of the hand of Mrs. Ann Cartlidge Tyndale Harold, grandmother of the lender. 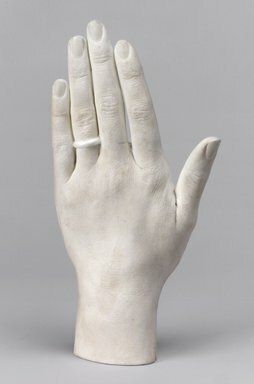 Fingers are held together and straight, thumb slightly extended, plain band around ring finger, cast is hollow and terminates just above wrist. CONDITION: Good with firing cracks inside at wrist, slightly soiled.